This incredibly nutritious, perfectly paired duo of barley and wild rice provides double the nutrition that compliments this delicious grain side. Cooked in no sodium veggie broth with a generous amount of thyme. This combination makes an excellent accompaniment to any dish, hot or cold. Goes very well served cold with dense veggie salads as well. This side combines very well with my ‘Tangy Leafy Greens & Garlic‘ recipe. An interesting fact about barley; it is a member of the grass family and is classified as a grain. It was one of the first cultivated grains, particularly in Eurasia as early as 10,000 years ago. 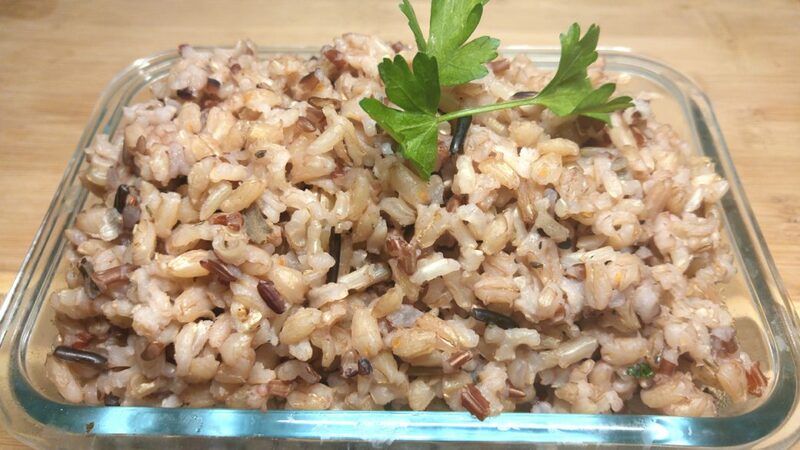 Barley and wild rice cook extremely well together. Bring to a boil uncovered, then cover, reduce to a low simmer and cook for 60 minutes. Although not really necessary, I prefer to mix at the 30-minute mark.